Here we take a look at how Denmark managed to win such a clear victory in the WOC Sprint Relay – and how the race was decided. The Sprint Relay is a very hectic race – and due to the forking it is difficult to understand during the race if it is running speed, forking or technical mistakes which really decided the race. 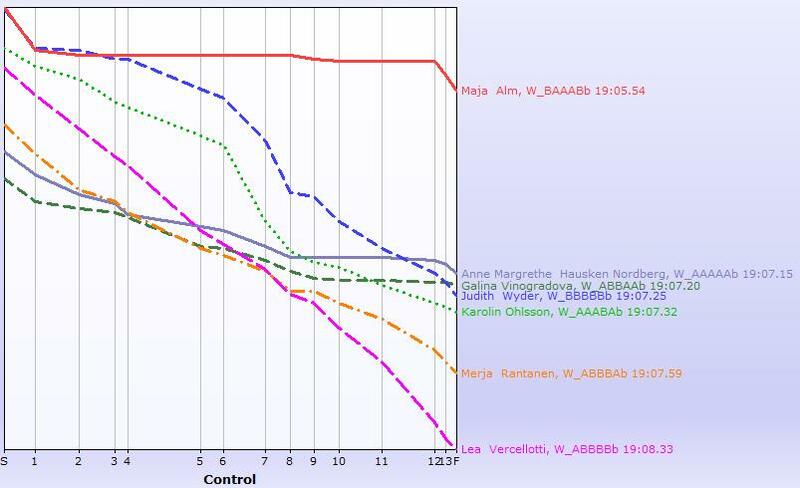 Based on the below analysis, it is clear that Denmark won due to stable and fast races by their two women – they simply had another speed. In the same way Norway took silver due to fantastic performance by their two women – especially Hausken Nordberg on the last leg. And Galina Vinogradova saved the day for the Russian team. Switzerland would of course have been up there on the second place (and even fighting for victory) if Judith Wyder would have had a normal day. Both France and Switzerland had better performance on the men’s two legs in the middle part of the race, but the way the Sprint Relay is constructed, this is all about the women – with women both starting the relay, finishing the relay, being more unstable in the performance (might be controversial to say, but it is clear from almost every analysis from international orienteering) and with bigger differences between the best women than between the best men. The below analysis is divided in two. 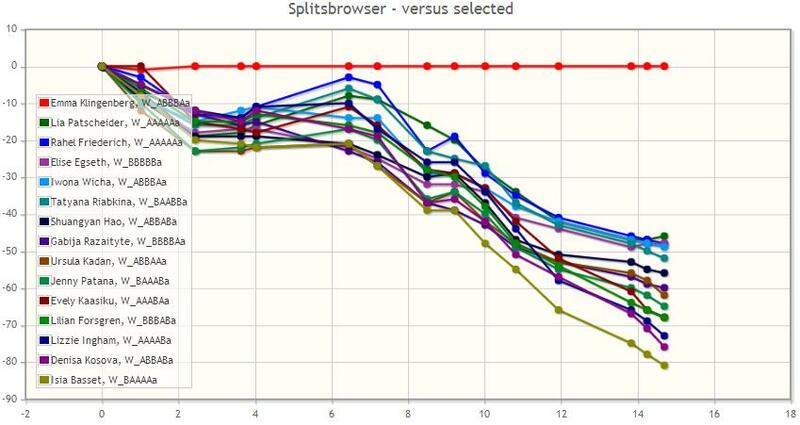 First a split time analysis where all the common controls are compared – without looking at forking in detail. Then a complete GPS-analysis of the womens’ legs – for the men only the GPS-illustrations are shown without discussion. For all GPS-illustrations actual split times from the split time system are shown. 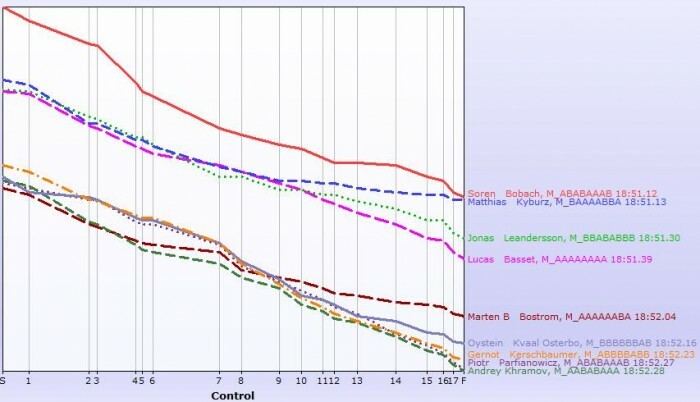 The reason for only analyzing the women’s leg is that this is where the main decision were made – and due to limited time (analysis of mixed sprint relay is the most time-consuming of all analysis – important split times in different formats, analyzing forkings etc). It is a pity, because there is a lot of interesting things happening also in the men’s race. Also several men doing wrong routechoices and mistakes – but in the end that was not the most important for the outcome of the relay. If somebody has more details about the men’s race, you are very welcome to add a comment below. Note: Due to some server problems at the news part of World of O (news.worldofo.com) Sunday morning, this article is published on O-training.net instead of at News.Worldofo.com – the quality & content should be the same though. We are working to sort out the issues at news.worldofo.com. The above splitsbrowser for all the common controls on the first tells the story about how dominant Denmark’s Emma Klingenberg was on the first leg of the Sprint Relay compared to everybody else. She opened a gap of 12-13 seconds to everybody else after only 2 minutes of running, then was nearly caught again by Swiss Rahel Friederich – before speeding up and simply running away from everybody in the easier last part of the leg, winning the leg with 48(!) seconds. 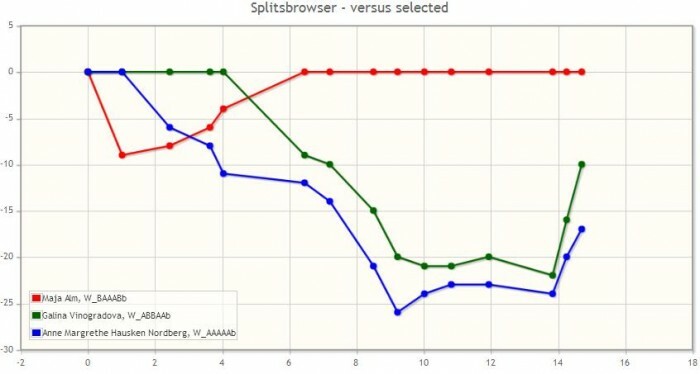 The below analysis shows that there was so significant time difference due to forking between Klingenberg and Friederich. 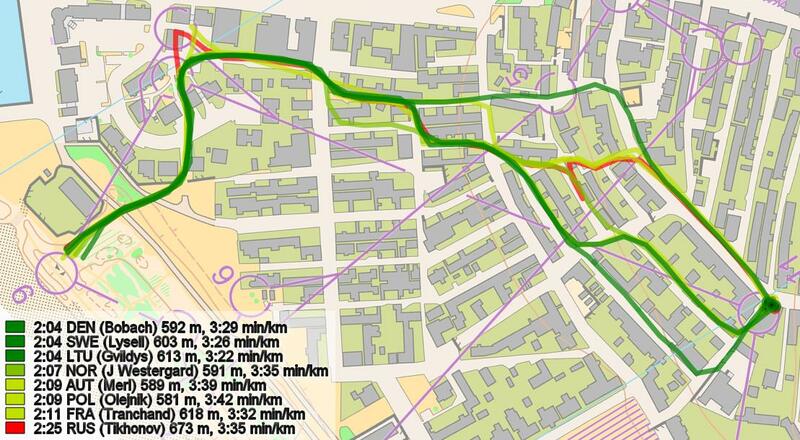 Friederich did some route choice mistakes (especially to number 10 where she lost 18 seconds), and ran slower. On the second leg Denmark’s Tue Lassen manages to nearly keep the gap – running a good and lonely race with several chasing runners eventually growing into one group. Fastest here is Frederic Tranchand (France). If Martin Hubmann would have ran a race like Tranchand, Switzerland would have nearly had contact with Denmark at the end of the second leg. Instead there was still a big gap to cover for Kyburz on the next leg for Switzerland. Jerker Lysell also runs a very good race. Looking at a comparison between the runners makes the details come out better (see below). 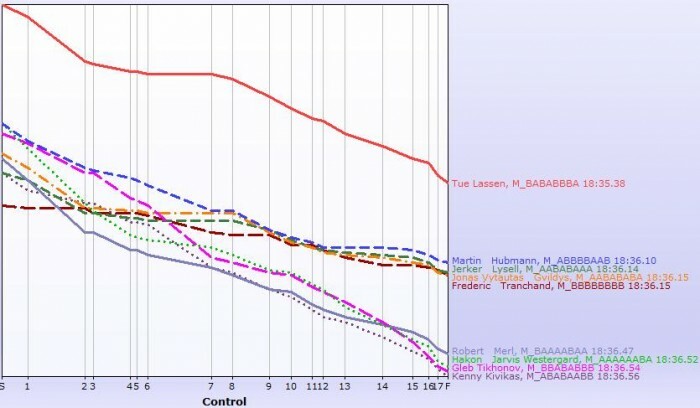 Here you can see clearly how Tue Lassen loses a lot of time in the first part of the race and in the second half of the race – more than 40 seconds in total – but luckily for Lassen the closest chasers were not the fastest. Norway’s Westergård loses nearly 45 seconds in the first part of the course, but manages to get up the speed after some minutes of running. On the third leg Søren Bobach loses time all the way. A pack consisting of Matthias Kyburz (Switzerland), Jonas Leandersson (Sweden) and Lucas Basset (France) picks time in the start. Then Kyburz drops the two others and gets all the way up into Bobach’s back while Leandersson and Basset lose time towards the end. Further back in the field there is another pack with Mårten Boström (Finland) getting away towards the end. Norway’s Kvaal Østerbø and Russia’s Khramov have a big gap of more than a minute up to the leaders at this point – and nobody expected that they were fighting for silver. Kyburz’s speed in the last part of the race is very impressive when comparing to the other runners on the third leg – but when comparing with the second leg (see further below), French Tranchand actually has even higher speed towards the end. 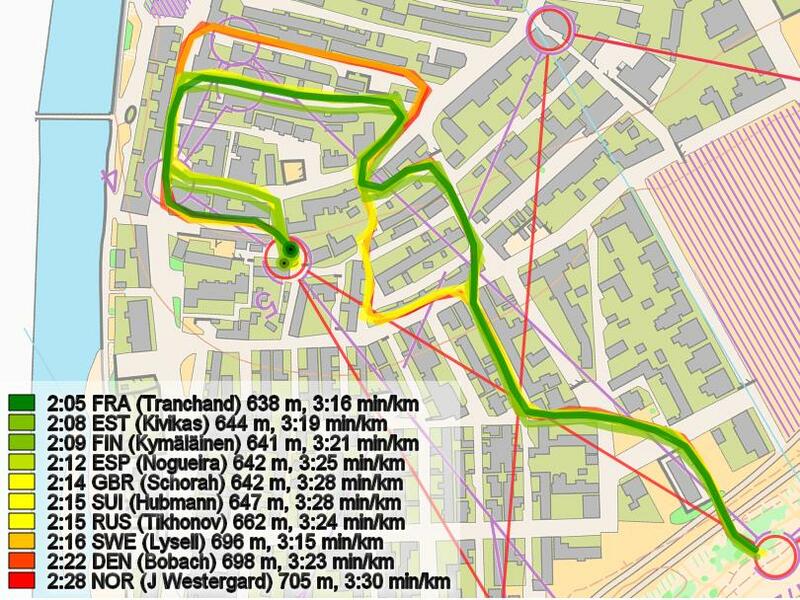 This looks very interesting for Tranchand for the Sprint Final! The last leg was a big triumph for Denmark’s Maja Alm. Swiss Judith Wyder started faster, and was in the lead for the first controls, but after 4-5 minutes of running the Swiss runner collapsed – according to the Swiss Federation website it was due to a combination of starting too fast, back problems and the shape not being optimal. In addition Wyder several bad route choices, losing even more time. These issues combined made the Swiss runner completely lose the performancee and speed we have been used to see from Wyder. Wyder loses 90 seconds to Maja Alm, and in the end Norway’s Anne Margrethe Hausken and Russia’s Galina Vinogradova come past.Sweden’s Ohlsson lost both due to mistakes and due to low speed – she definitely had the chance to secure silver for Sweden. 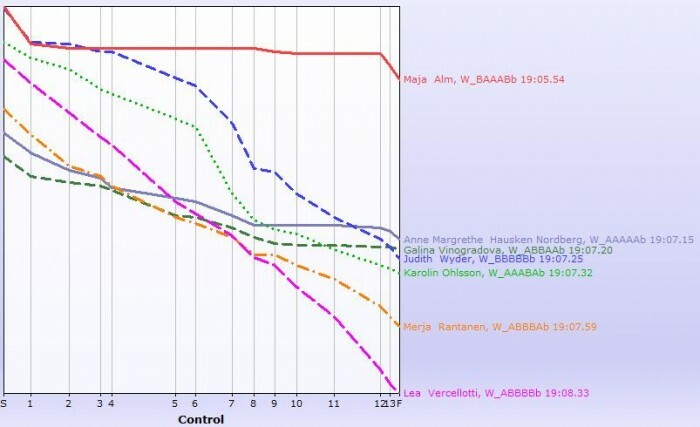 Comparing Alm’s race with the other women, it is still a fantastic race, but “only” 20 seconds faster than Hausken Nordberg and Vinogradova (and Klingenberg also being around those two) until Maja Alm starts celebrating some controls before the finish. All of these 20 seconds are gained in the middle part of the race where she simply runs a lot faster. Incredible speed by Alm – she will be difficult to beat in the individual sprint. Now let us look at how she opened up the gap in the first part of the leg. There is forking already to the first control, and Emma Klingenberg has the shorter forking (left control) here along with Friederich (Switzerland). Sweden, Norway and Russia have the longer forking and loose in average 5 seconds to Klingenberg. The forking is probably around 5 seconds slower – confirmed by an analysis by Mike Vinogradov here. The gap further opens up on the forked part from control 2 to control 4 – mainly on the long leg to control 3. Here it is not the forking difference that is the most important, but rather Klingenberg’s incredible running speed. On the stretch from control 2 to control 4 she is 7 seconds faster than anybody else – the top teams lose between 9 and 11 seconds. Norway and Sweden have the same forking as Denmark (leftmost, all three drawn in green below) and each lose 10 seconds (Egseth with the wrong routechoice – going right and nearly visiting the other control). Russia and Switzerland have the rightmost forking and lose 9 and 11 seconds (both drawn in red, Friederich runs furthers to the right). 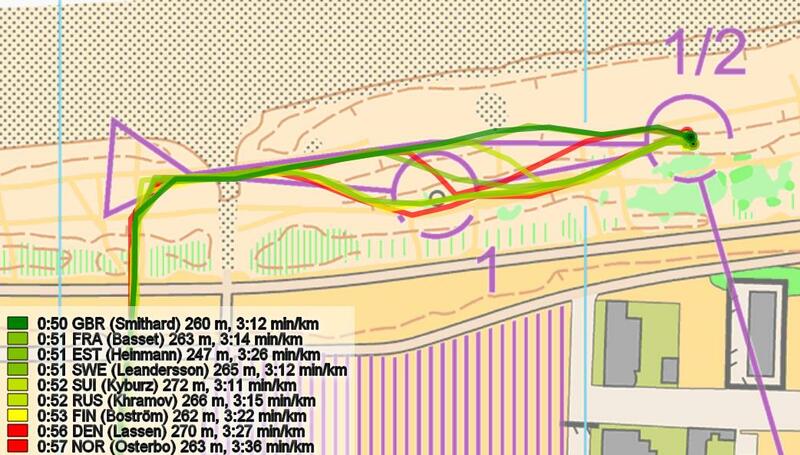 According to Vinogradov’s analysis the left forking is 5 seconds faster, though – so if this is correct the Norwegian/Swedish team did not have a perfect execution of the leg. Note however that this forking is balanced against the forking on control 7 – the ones who lose time here, gain time again at control 7. To the 8th control Klingenberg is nearly caught again. 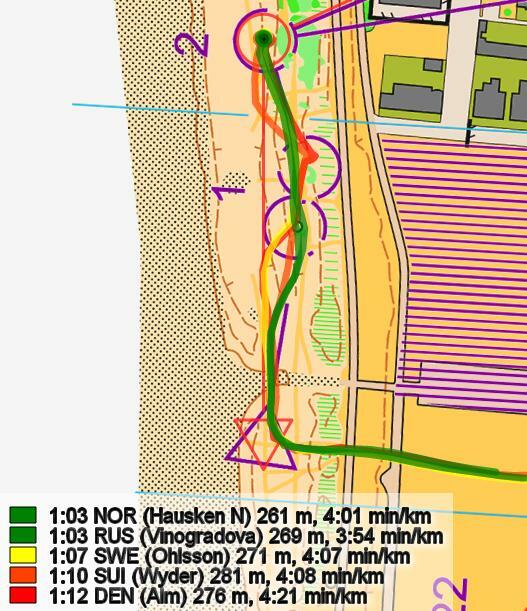 The reason is first some hesitation in the sand dunes – and then a longer forking (leftmost control below, routes drawn in green). Switzerland and Russia have the rightmost forking (routes drawn in red) and are between 8 and 13 seconds faster than Denmark, Sweden and Norway who have the other variant. Vinogradov estimates a forking difference of 7-8 seconds between the forkings. Thus the total difference for the two forkings at the 3rd and 7th control is only a 2-3 seconds, which is probably within the uncertainty of this analysis. Now at the 8th control Klingenberg’s gap is reduced to only a few seconds to Switzerland – and thus the very big gap at the 6th control to Switzerland was more due to forking difference – and Switzerland managed to come up again. But now comes another routechoice leg where Klingenberg runs extremely fast. This time an unforked leg to control 10. Klingenberg again beats everybody with 7 seconds – Norway’s Egseth being closest. Russia and Switzerland took a very wrong routechoice and lose 14 and 18 seconds – Switzerlands runner even changing her mind on the way and losing even more time. 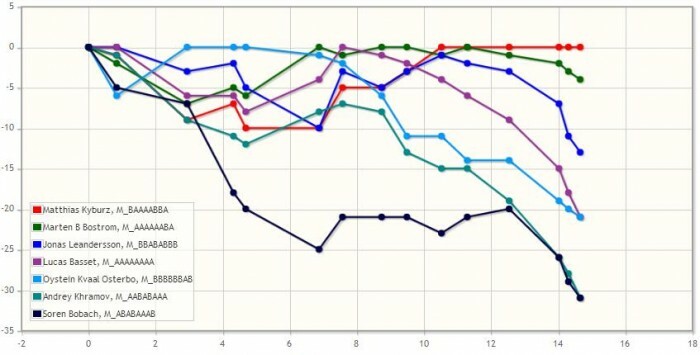 So it was on an unforked leg that Klingenberg really opened up the gap – the others of course did not know that it was unforked, that’s the beauty of forking in relays. The next forking is from control 10 to control 13/14. Here the runners either skip the 11th or the 13th on the map below. Skipping the 11th can save you quite a few seconds if you take the correct routechoice around to the left as Friederich does (4-6 seconds lost with extra control). Skipping the 13th seems to save you even a few more seconds based on the runners on the first leg (Switzerland loses 10 seconds, Sweden 8 seconds), and thus Denmark’s forking seems to maybe be a little bit faster on this first leg. 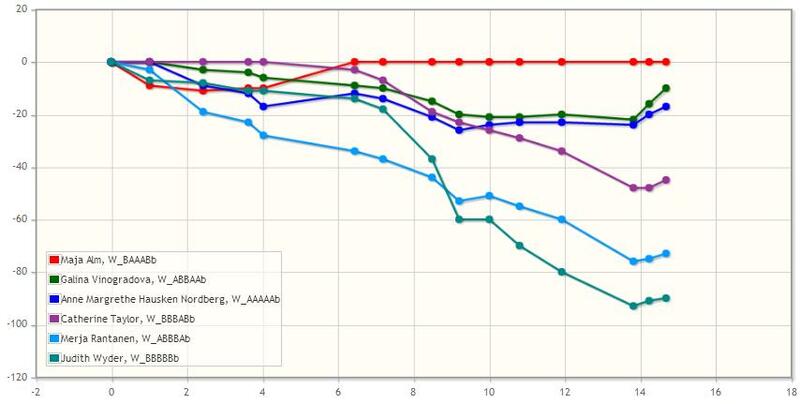 However, Vinogradov’s analysis by looking at the last leg in addition shows exactly the opposite, Klingenberg’s forking being 5 seconds slower. This is due to the last leg runners being faster in this part of the race. Thus no clear conclusion to be made here, but Klingenberg probably runs faster than all the other first leg runners here. Overall on the first leg Klingenberg uses this place to increase her lead. 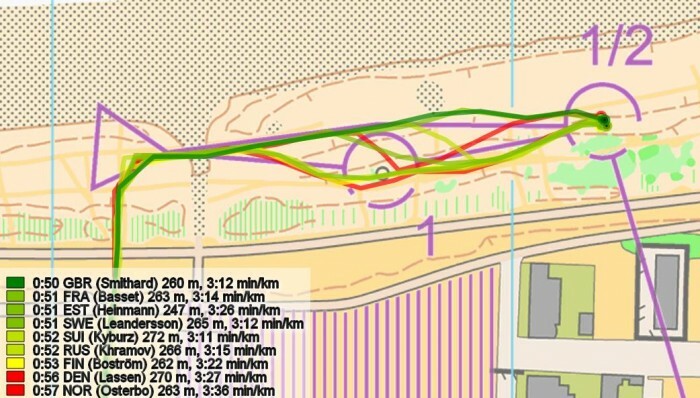 Then another control were Klingenberg simply runs faster – now also the forking gives her a few seconds advantage (at least according to Vinogradov’s analysis – and on the map it also looks slightly faster). 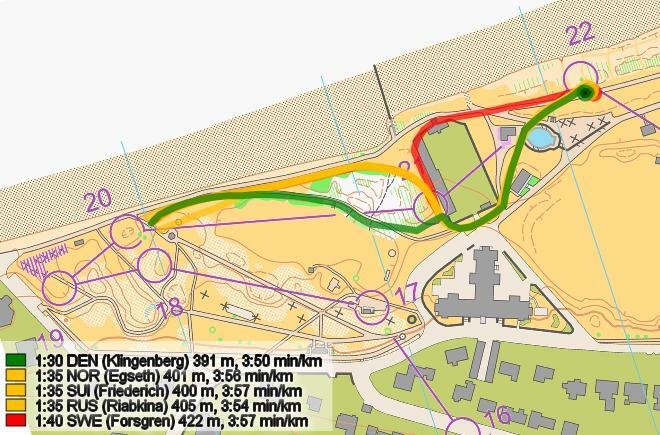 And in the easy part in the park in the end Klingenberg simply ran faster – and did the correct choices. Just a quicker look at the last leg based on the analysis for the first leg above. Wyder and Alm had the long forking to the first control and lost some seconds to the best chasers. Alm has the longest forking at the 3rd control, but still manages to run the same time as Wyder – a big advantage ahead of the next forking at the 7th control where Wyder will now have a 7-8 second longer forking, but she has no gap from this 3rd control like she normally should have had. To the 5th control Alm simply runs faster. The difference in routechoice here is not decisive. Then Alm has the advantage of the shorter forking at control 7, and beats Wyder with 13 seconds. 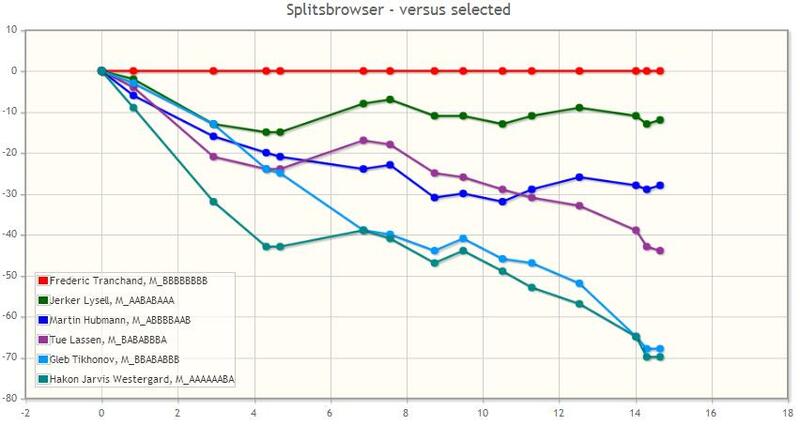 This is partly due to shorter forking (7-8 seconds?) and partly due to higher running speed. Hausken Nordberg with the same forking is 5 seconds slower. Sweden’s Ohlsson who also has the same forking is 22(!) seconds slower. Russia’s Vinogradova has Wyder’s forking and loses just as much time as Wyder – 13 seconds. Then the leg to number 10 is again decisive. Sweden’s Ohlsson misses an opening and loses more than 10 seconds due to this mistake. Wyder takes a longer routechoice and has lower speed – loses 19(!) seconds to Alm on this leg alone. Another really bad routechoice by Wyder to control 11 – here she loses 23(!) seconds to Alm. 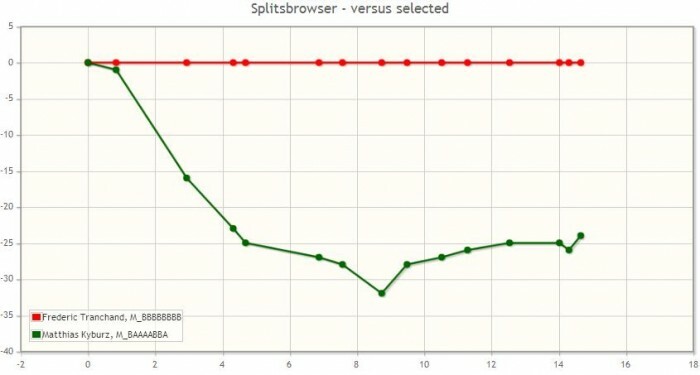 Not all of the time loss is due to the routechoice (which is maybe more a mistake than a routechoice), but the routechoice in itself is at least 10 seconds slower. Note that the names of Tue Lassen and Søren Bobach seem to have been swapped here. This is actually Lassen running.